If you loved our previous house features, you will surely adore this house that will showcase today. 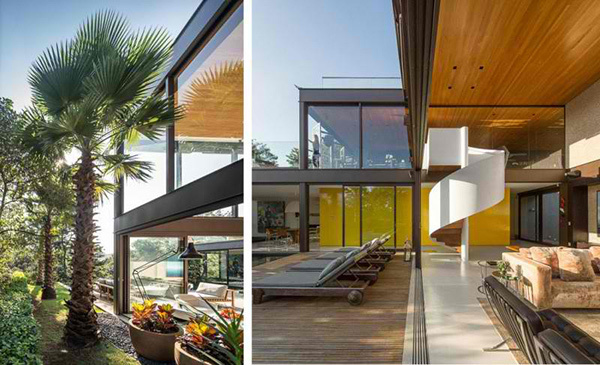 It is called the Limantos Residence located in São Paulo, Brazil. We’d guess, there are lots of lovely homes in the area for we have featured many impressive homes that are located in Brazil. Well, the Limantos Residence is just one of them. 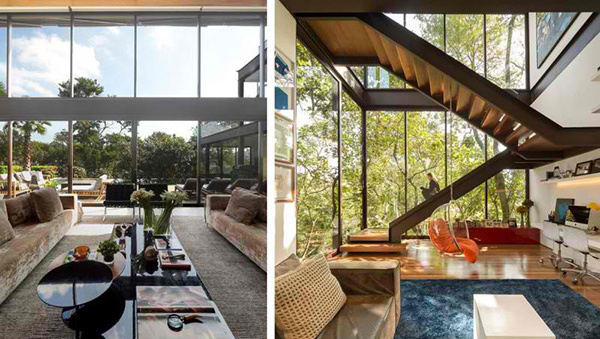 Like most modern homes, this one also used glass, steel and even wood as materials to complete its look. But what we think made it more stunning is the pool area with a spacious courtyard. 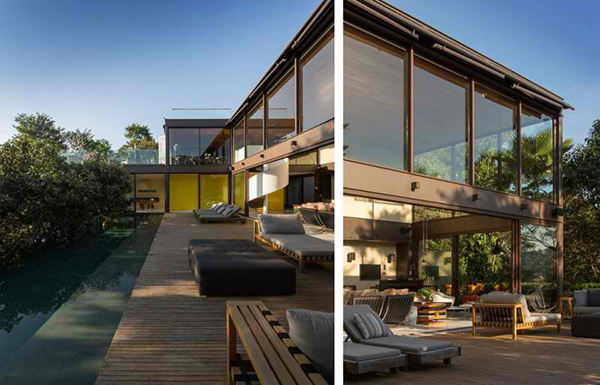 With that, the house gets a modern villa feel and a vacation aura especially that it is surrounded by plants and trees. Interested to see the house? 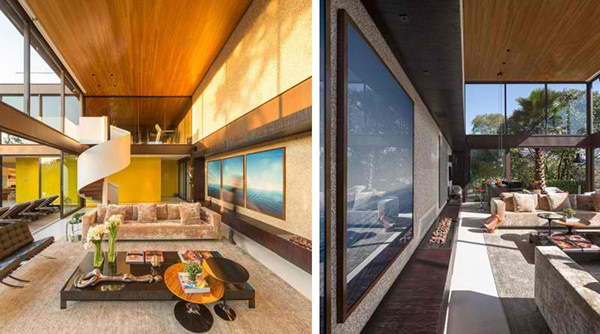 Scroll down and feel the paradise-like aura of the house. This view will make you feel like jumping into the picture as it remind us of our dream summer vacation but with this kind of home, you don’t need to go far. Another view of the home’s outdoor space from the upper level showing the large pool and the wood deck. When the lights are on, the home’s beauty is even alleviated! Wooden decking looks perfect for this house which seems to add a softer touch to it despite its use of steel and glass for the structure. You can see here a look at two areas of the house, the outdoor lounge area and the living area. 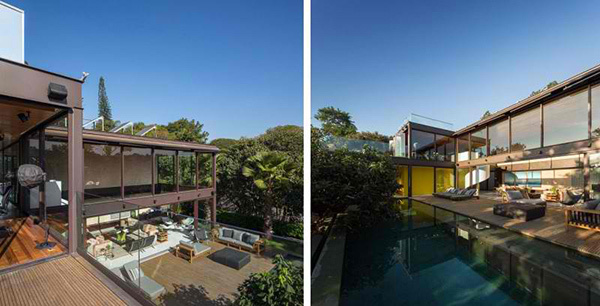 The trees and its landscaping added that paradise feel to the home. On the other side you will get a glimpse of the home’s interior. The living room has a double ceiling height which makes it even more airy especially with the glass that surrounds it. You can see that it used a large low black table paired with modern seating. 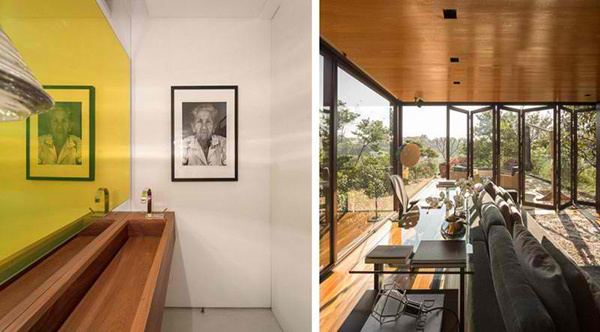 The wooden ceiling lends more beauty to the interior as well as its black horizontal shelf on one side of the wall. That transparent swing chair is certainly lovely and is an interesting item in this area. One side of the living area features this wall shelving that has lighting behind it. We can see that there is another seating area in the same floor. All in all, there are three seating groups for the lower level making it perfect for welcoming guests. 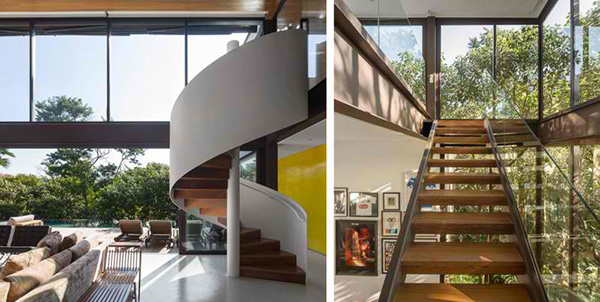 The home’s staircases are definitely beautiful. You can see here a spiral staircase while the other has glass railings on it. What you see here is another shot of the living area with gray sofa while the other picture shows us a wooden lavatory. A closer look at the wooden lavatory for the vanity. 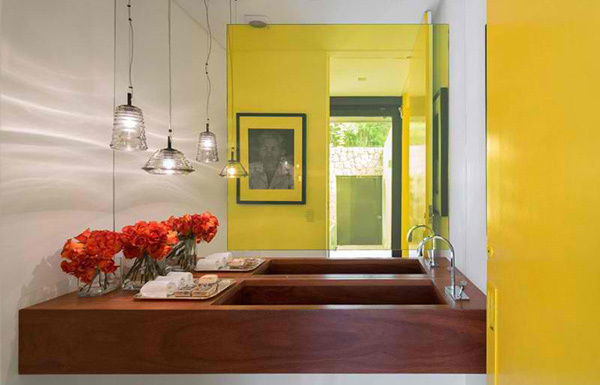 Having yellow walls in this area made it look happy and lively. 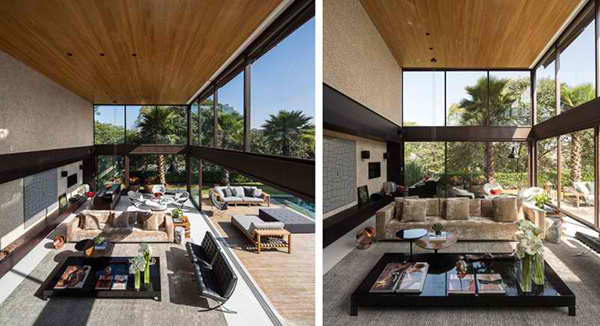 With the design of Fernanda Marques, the house turned out into what every homeowner would like to have. 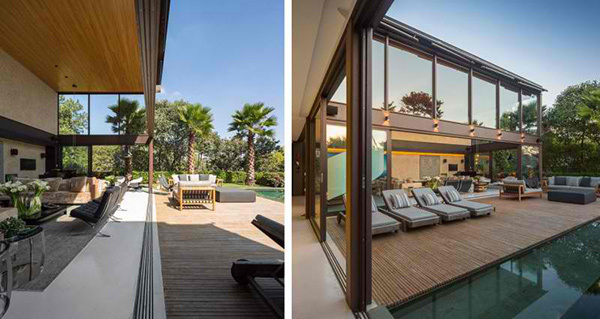 It has a modern design, it is an outdoor space that allows the homeowners to spend time with nature, it has an interior that is brings the outdoor beauty inside through its glass walls, and it has functional spaces that can be easily accessed through its well-planned layout. Every single element in it contributed to the modern paradise appeal of the house. Can you tell us what you love about this house?